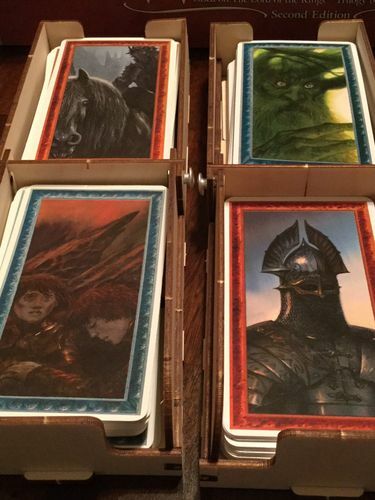 My favorite game of all time is War of the Ring (2nd Edition), and it is one I always enjoy playing. Setup and teardown have always been a beast on this game, and for years we’ve gone with the “baggie” solution. 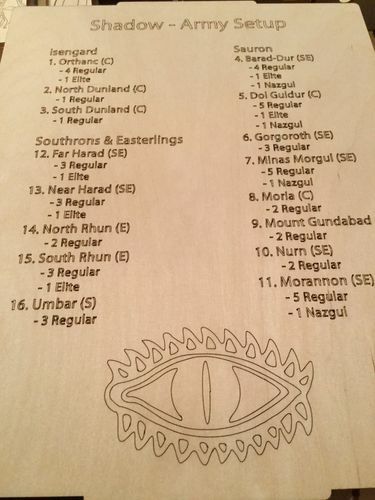 My wife was clever enough to use a sharpie to give each starting location a bag and have it marked with what unit(s) go in the bag and where they start on the board. 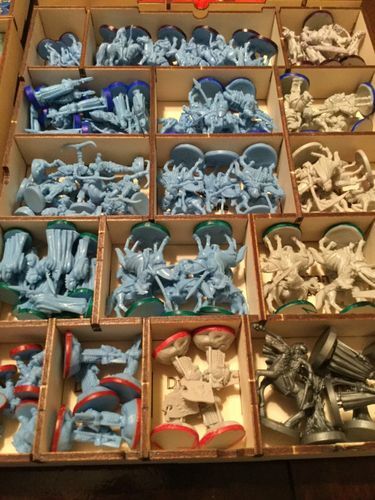 But that makes for a ton of bags, not counting the extra reinforcements on both sides, expansion material, and more. All told, I’d believe we had close to 100 baggies in this massive box. Now? 0. This was the non-game Christmas present I wanted more than any other. Sadly, it didn’t come. So when I had a little extra money I decided to pull the trigger and pick up this insert, knowing that it would likely pay for itself over the course of repeated plays of this great game. I had very few issues navigating through the Meeple Realty website. 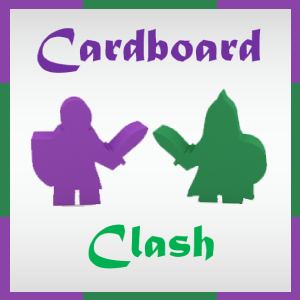 It is very user-friendly, and I love how they have a section to search by compatible games. 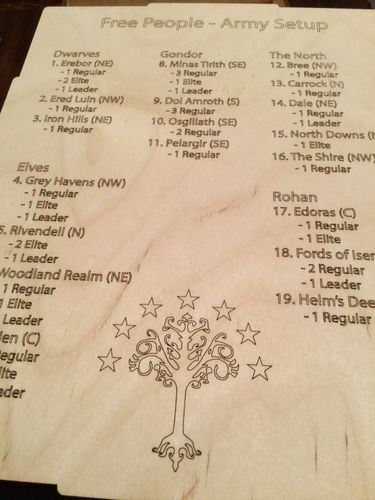 That makes it so you can find this insert by either knowing its name (The Shire) or the game it partners with. Ordering took a matter of minutes to complete online, having to set up an account since it was my first purchase. Within minutes of placing the order I had a confirmation in my email, followed shortly by a tracking number for my shipment. I was beyond impressed with the process, and delivery was prompt and everything arrived safely. The instructions for putting the insert together were laid out really well. Items were clearly shown in images and marked well to correspond with the pieces in the package. They even have an illustrated guide on how to fit everything into the base game box, which is excellent. 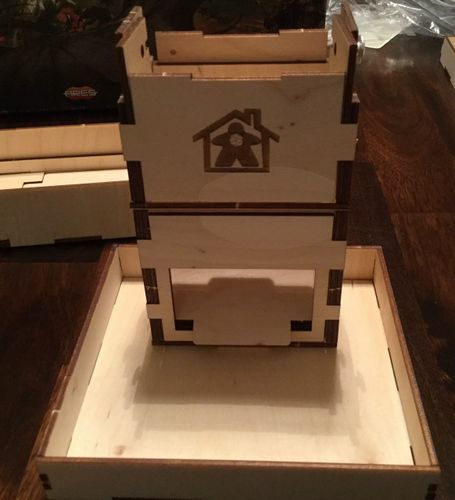 The one area where it fell just a little short was on the Dice Tower/Card Holder construction. A few extra images would have helped tremendously with what was, easily, the most complicated part of the construction process. The wood pieces all popped out with minimum difficulty and, once I got used to how everything was intended to “snap” together (I caught on by the time I finished assembling the first piece: the free people’s storage box), everything was relatively easy to construct. 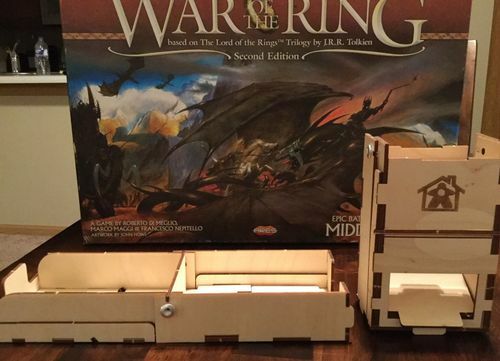 As mentioned with the above section, the hardest thing was the Dice Tower/Card Holder. The pieces fit well together to form a sturdy set of structures even without the use of wood glue. The instruction guide led through things really well, making it clear what went where in the assembly process. No complaints overall about this, especially considering I’m not a particularly handy person and this was my first insert to construct. Here’s the important thing: what impact does this have on the game experience overall? 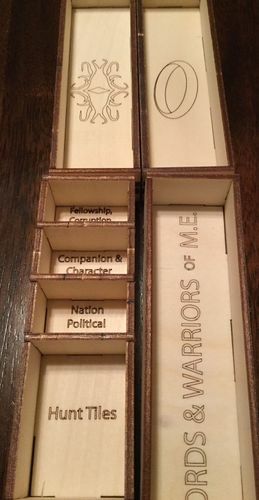 We’ll start with the portion I’ve talked about the most: the card tray/dice tower. 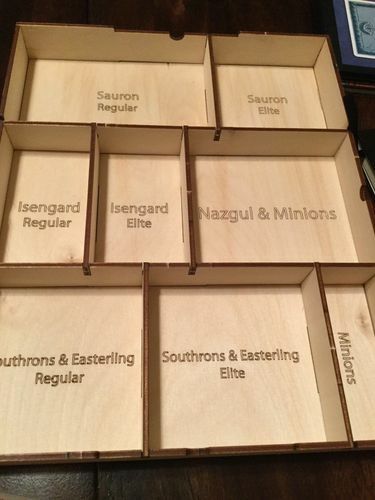 The process to convert it is relatively easy, however I did have a few issues fitting it into the bottom tray (where the factions from the Warriors of Middle-Earth expansion are stored). This may have been due to not having the screws yet, but once it got in there it stayed well. The dice tower functions really well, although it is rather loud. Since we were playing at 11:00 at night, we stopped using them after that first roll. But if noise isn’t an issue, these are a great addition. Setup and teardown are both markedly improved by the storage trays. 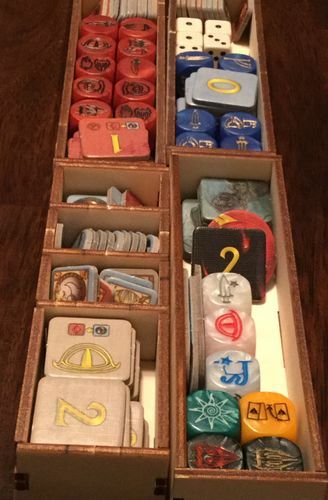 The “cheat sheet” printed on the lids is a wonderful addition, and the trays also function really well during gameplay for pulling reinforcements. My one wish, if it was a perfect world, would be to have a “graveyard” for the defeated Free Peoples units, since they can’t be reused during the game. For now, they just went off to the side on the table when dead. 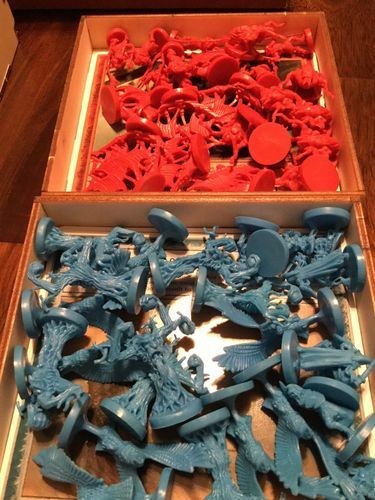 The token trays were really handy, allowing each player to have access to the tokens they might need for the game. We didn’t use any expansions, since it was my buddy’s first time playing the game. 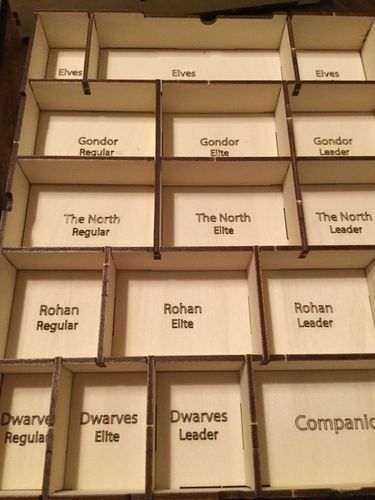 Which did, unfortunately, mean that I had all of the Warriors of Middle-Earth factions scattered on the kitchen counter to construct those Dice Towers that I never used due to noise. 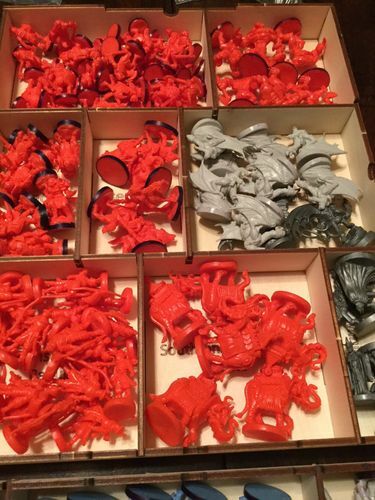 So that is one minor drawback: there is no good way to use that bottom portion of the Dice Tower without having to pull out all those figures. Even when using the expansion, that means you likely need to stack them on the table until you need them. 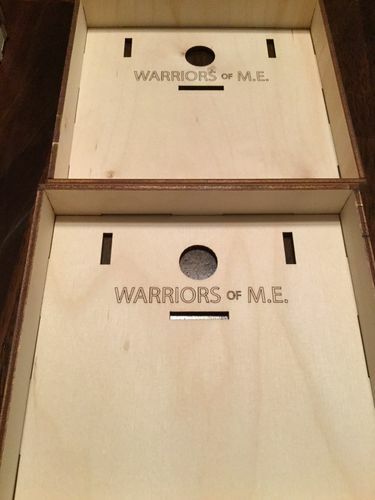 Or forego using the tray for the Dice Tower. Overall, I really enjoy the product. I was impressed along every step of the way: the purchase, shipment, resolving the missing parts issue, and the construction of the product. This is going to help the game hit the table more often because it reduces some of those excuses to choose something else instead. If you own the War of the Ring (Second Edition), I can’t recommend this highly enough.